Recently several companies have recalled a C5 type Appliance connector part of a cordset (Australian plug, cord and appliance connector for connection to equipment) that was supplied with equipment. It is reported the fault identified may cause the appliance connector to overheat and cause a fire or burn hazard. The appliance connector is marked LS-15 and LINE TEK and SAI TE4211EA. Cordsets are level 1 equipment in the EESS. Responsible suppliers supplying cordsets, either separately or with their electrical equipment, are required to ensure the cordset parts (plug, cord, appliance connector) have current valid certification and are electrically safe. If you supply cordsets, either separately or with your electrical equipment, you are requested to check if the cordset appliance connector has these markings, and if so then you need to confirm your appliance connector does not have the same fault and is electrically safe. NOTE: it is understood not all appliance connectors of this manufacturer or certification will have this fault. 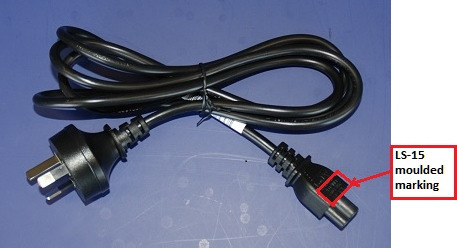 PAULSPIECE COMMENT: the “cordsets” mentioned above are mains power cord set assemblies comprising a mains plug, flexible electrical cord and an appliance connector. Refer to the first image below (images borrowed from the recall notices). All three components individually are Level 3 articles, requiring individual electrical authority approval and EESS registration at Level 3. However the fully-assembled cord set itself is Level 1. There have been three safety-related recalls of the affected IEC 60320 type C5 appliance connector model LS-15 in Australia in recent months from different suppliers (refer to earlier separate posts in paulspiece.com).